A tray of strawberries in South Australia has been auctioned off for a whopping $17,500 as Australian farmers start to bounce back from the strawberry needle tampering crisis which rocked the country last month. The tray was auctioned off as part of a charity auction for local children’s charity Variety SA to kick off the new strawberry season, emulating similar auctions held in Queensland to promote the start of the mango season. At about $1,100 a punnet, ABC reports the tray was bought by local retail group Romeo’s Food Group, which owns a number of local grocery stores in the Adelaide region and some across New South Wales. In a Facebook post, the food group said it was “proud to be a part” of the first produce auction of its kind in South Australia. “This is the first time anything like this has happened in SA and we were so proud to be part of it! 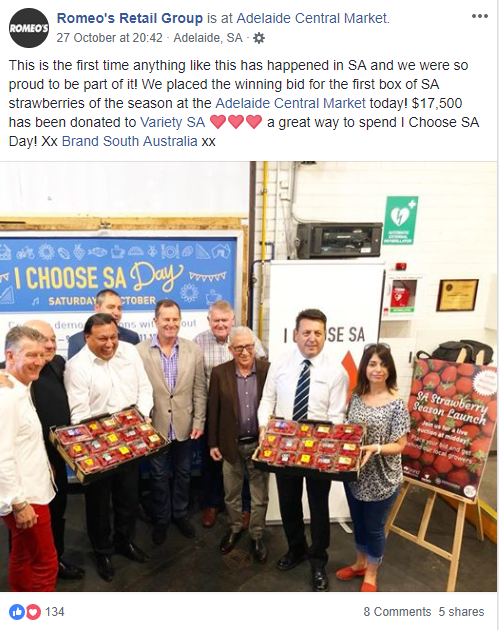 We placed the winning bid for the first box of SA strawberries of the season at the Adelaide Central Market today!” the local business said. The ongoing sabotage of strawberries across Australia is still an unsolved crime, and the needle tampering which affected numerous independent and large-scale strawberry growers had a significant impact on an industry already suffering through a tough drought season. And despite the horrors of needles in fruit turning many off strawberries, some growers said the industry’s ruin was foretold, with a glut in the number of strawberries produced contributing to what some growers called the “worst ever season”. Some growers believe the tough times have led to disgruntled workers, resulting in situations such as the needle crisis. “Some of the bigger farms have five million plants, so think of how many workers they each have. There could be 10,000 people out of work out of this. And that’s locals too, not just backpackers,” Shaylee Strawberries owner Bob Sheehy told the New Daily. However, some growers have told media things are looking up, with some supermarkets across the country pledging to return all profits on the fruits directly to farmers, and a groundswell in support from the community. “Many people go through many ups and downs and sometimes it only takes one act of kindness to bring people back belief and instil the sense that there is still a lot of goodness in people,” grower Minh Tran told PerthNow. Additionally, police are starting to make some headway into investigations related to the scandal, arresting a man who allegedly made a false claim to police there was a needle in strawberries he purchased. The man has pleaded not guilty to the charges.